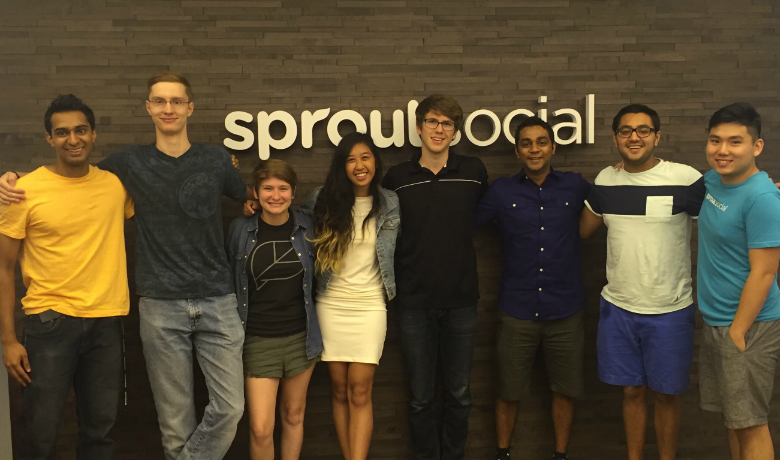 What’s it like to spend the summer as an intern on Sprout Social’s engineering team? It’s a lot like working here full-time: fun, meaningful and collaborative. From day one, engineering interns at Sprout are part of the team. Our internship program is designed to help college students, typically computer science majors, gain experience working in the tech industry, deploying code and exploring where they want their careers to go. Interns work hard, enjoy events and outings around Chicago and leave with a stronger understanding of what it takes to pursue a career in software development. From deploying code to escaping during Trapped in a Room With a Zombie, interns enjoy a range of challenges inside and outside of the office. Each intern joins an engineering squad, like Mobile, Publishing or Infrastructure), and spends their summer working with full-time engineers on features that impact more than 19,000 customers around the world. Interns are also matched with a mentor, typically a senior engineer, with expertise in their areas of interests. Throughout their time at Sprout, interns work with their squad as well as their mentor to ensure they’re developing both their technical and professional skill sets. This summer’s nine interns worked on a wide range of projects. While many of their projects haven’t yet been released, Sprout users have already benefited from their efforts. Megan, a student at Washington University in St. Louis, worked on data recovery enhancements for our NSQ-powered message bus. This helps engineers (and in turn, customers) get the social data they need more efficiently. Philip, a student at Northwestern University, worked on updates to the front-end coding for one of our reports, addressing challenges like handling data from multiple networks. And Kishan, a student at Carnegie Mellon University, tackled an image resizing service as his summer project. This behind-the-scenes update helps all thumbnail images load faster, which saves Sprout bandwidth and helps pages load faster for our customers. “It was an amazing opportunity to take the lead on a meaningful project from design to production and see it being used by nearly every Sprout customer,” said Kishan. Each intern was matched with a Sprout engineer with whom they met regularly over the course of their internship. Mentoring is an opportunity for experienced engineers like Paul Bersch, a Software Engineer on Sprout’s Platform Team, to teach and reflect on their own work process. “I love mentoring new engineers because their eagerness to learn pushes me to understand what I’m teaching even more clearly and completely. Teaching helps surface the unconscious knowledge I’ve accumulated, not only refreshing my memory but sometimes giving rise to new combinations of ideas,” said Paul. In addition to learning alongside full-time engineers, interns got to know members of Sprout’s leadership team. Kishan described the one-on-one meetings with senior engineers and Sprout’s founders as beneficial to his personal growth and development. “These conversations really helped me gain insight into what’s most important to focus on in college and for my career. Everyone is passionate about the work they do and committed to helping each other learn and grow,” he said. With the new school year in full swing, most of this summer’s interns are back at their respected colleges and universities. We were excited to hire one of our interns as a full-time employee and hope to see this pattern continue as Team Sprout grows. Throughout the fall, members of Sprout’s engineering and talent teams will be attending career and internship fairs across the country. 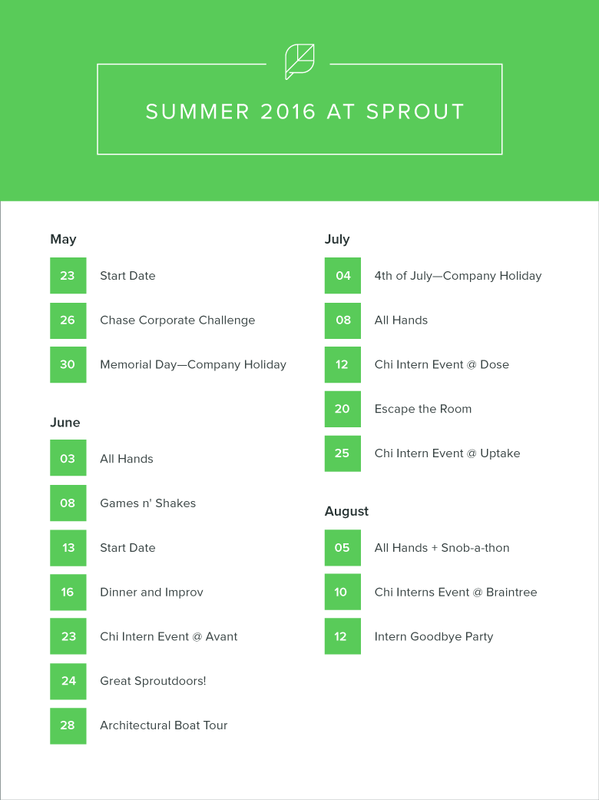 Check out our events page for an up-to-date look at where we’ll be, and if you’re interested in joining Team Sprout, see our careers page for current postings.